Over a third of HAMP participants have exited the program and another batch is coming up. Those leaving the program will likely end up in foreclosure. Moreover, 4 million delinquent borrowers are not even eligible for the program. Please consider Borrowers exit troubled Obama mortgage program. The Obama administration's flagship effort to help people in danger of losing their homes is falling flat. More than a third of the 1.24 million borrowers who have enrolled in the $75 billion mortgage modification program have dropped out. That's more than the 27 percent who have managed to have their loan payments reduced to help them keep their homes. 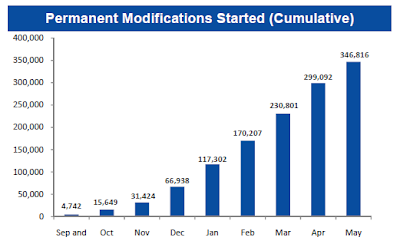 Last month alone, 150,000 borrowers left the program -- bringing the total to 436,000 who have exited since it began in March 2009. A major reason so many have fallen out of the program is the Obama administration initially pressured banks to sign up borrowers without insisting first on proof of their income. When banks later moved to collect the information, many troubled homeowners were disqualified or dropped out. Here are a couple of charts from the Making Home Affordable Program Servicer Performance Report Through May 2010. Not all 60-day delinquent loans are eligible for HAMP. Other characteristics may preclude borrower eligibility. Based on the estimates, of the 5.7 million borrowers who were 60 days delinquent in the 1st quarter of 2010, 1.7 million borrowers are eligible for HAMP. 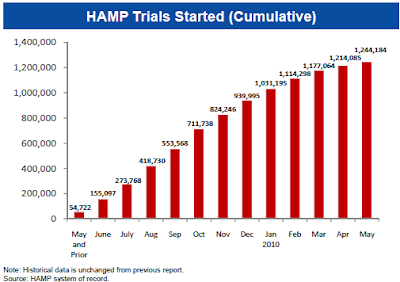 As this represents a point-in-time snapshot of the delinquency population and estimated HAMP eligibility, we expect that more borrowers will become eligible for HAMP from now through 2012. Only 30% of the 5.7 million borrowers who are 60 days delinquent are eligible for the program. 4 million delinquent borrowers are stuck. Of those eligible for the program, only 346,000 have completed the trial and received a permanent modification. Many of those receiving a permanent modification will slip back into default and head for foreclosure. Many of those who successfully keep their house would be better off if they lost it. Looking at HAMP from every angle, it's safe to say the program was a failure and another huge wave of foreclosures is coming down the road. Still it's contained and the recovery is locked in so I'm sure this will merely be a storm in a teacup. Let's keep the market gpoing because our whole economy is resting on HP increases each and every year until we die. In fact let's prop it up even when its dead and pretend it's alive because the cost of pretending is cheaper. Wrong!! Thing is, they are finding out it is more expensive and cures nothing. Obama has no handle on the US economy or how to proceed atall. The recovery is now looking like a very bad magician has let us see behind the mirror. Many of those who successfully keep their house would be better off if they lost it. My suspicion is that these modified mortgages count as remortgages, and thus make a non-recourse loan full-recourse. So in other words most of these mortgages were liar loans to start with, hence Obama insisting on the banks modifying them without asking for proof of income. But as soon as the inevitable happens and the banks call the borrowers' bluff, goodbye and goodnight.